PNNL's new geothermal stimulation fluid could make geothermal power production more environmentally friendly and less costly where conventional geothermal doesn't work. The nontoxic fluid is designed to be used in enhanced geothermal systems, where fluids are injected into drilled wells that lead to underground geothermal reservoirs. The fluid expands when exposed to carbon dioxide underground, which creates tiny, but deep cracks in otherwise impermeable rock. RICHLAND, Wash. — More American homes could be powered by the earth's natural underground heat with a new, nontoxic and potentially recyclable liquid that is expected to use half as much water as other fluids used to tap into otherwise unreachable geothermal hot spots. The fluid might be a boon to a new approach to geothermal power called enhanced geothermal systems. 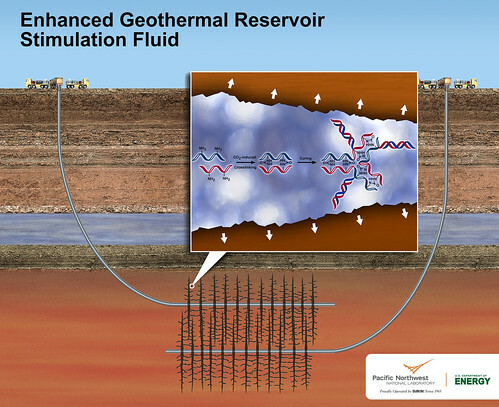 These systems pump fluids underground, a step that's called "reservoir stimulation," to enable power production where conventional geothermal doesn't work. The new reservoir stimulation fluid features an environmentally friendly polymer that greatly expands the fluid's volume, which creates tiny cracks in deep underground rocks to improve power production. This fluid could also substantially reduce the water footprint and cost of enhanced geothermal systems. A paper describing the fluid has been published by the Royal Society of Chemistry in an advance online version of the journal Green Chemistry. "Our new fluid can make enhanced geothermal power production more viable," said lead fluid developer Carlos Fernandez, a chemist at the Department of Energy's Pacific Northwest National Laboratory. "And, though we initially designed the fluid for geothermal energy, it could also make unconventional oil and gas recovery more environmentally friendly." Geothermal power is generated by tapping the heat that exists under the Earth's surface to extract steam and turn power plant turbines. Conventional geothermal power plants rely on the natural presence of three things: underground water, porous rock and heat. Existing U.S. geothermal power plants generate up to 3.4 gigawatts of energy, making up about 0.4 percent of the nation's energy supply. Enhanced geothermal power can be generated at sites where heat exists, but isn't easily accessible because of impermeable rock or insufficient water. A 2006 report led by the Massachusetts Institute of Technology estimates enhanced geothermal systems could boost the nation's geothermal energy output 30-fold to more than 100 gigawatts, or enough to power 100 million typical American homes. Interested in this potential, DOE has funded five enhanced geothermal system demonstration projects across the country. At one demonstration project in Nevada, enhanced geothermal methods increased a conventional geothermal plant's productivity by 38 percent. But the use of enhanced geothermal systems has been limited due to technical challenges and concerns over their cost and heavy use of water. Creating enhanced geothermal systems requires injecting millions of gallons of water - a valuable resource in the arid American West, where enhanced geothermal has the most potential. That water is sometimes mixed with a very small amount of chemicals to help the fluid better create and spread tiny cracks underground, which ultimately extends the life of a geothermal power plant. PNNL's fluid is a solution of water and 1 percent polyallylamine, a chemical made of a long carbon chain with nitrogen attachments that's similar to well-understood polymers used in medicine. The fluid is pumped into a well drilled at a geothermal hot spot. Soon after, workers also inject pressurized carbon dioxide, which could come from carbon captured at fossil fuel power plants. Within 20 seconds, the polyallylamine and carbon dioxide link together to form a hydrogel that expands the fluid up to 2.5 times its original volume. The swelling gel pushes against the rocks, causing existing cracks to expand while also creating new ones. The expansion is expected to cut in half the amount of water and time needed to open up an enhanced geothermal reservoir, which shrinks the cost of power generation. To test the fluid's performance, geophysicist and co-author Alain Bonneville led the development of an experimental set up. Five cylindrical samples of rocks, about the size of C batteries, taken near a working enhanced geothermal power plant in California, were placed inside a high-pressure, high-temperature test cell created by the PNNL team. Small amounts of the fluid and liquid carbon dioxide were injected into the test cell. Pressure and temperature were gradually adjusted to match the conditions of underground geothermal reservoirs. The researchers found their fluid consistently created small, but effective cracks in rock samples. Some of the new fractures were too small to be seen with a high-resolution imaging method called X-ray microtomography. But when they watched fluids such as water or carbon dioxide being injected, the team saw liquids moving through the previously impermeable rock samples. Moving liquids did not pass through rock samples that were injected with plain water or the common hydraulic fracturing chemicals sodium dodecyl sulfate and xanthan gum. The team reasoned larger-scale tests might produce bigger cracks. Small, colorful dots represent the movement of liquids through cracks created in a rock by PNNL's new geothermal stimulation fluid. The blue stem of dots at the bottom show a liquid being pumped up through a small well drilled into the cylindrical rock's center. The mushroom-like cloud of dots on the top show the liquid moving through a network of cracks created by PNNL's fluid in the rock. The red and yellow dots show liquid moving fast and through larger cracks, while blue and green dots show liquid moving slower and through smaller cracks. Two other benefits are the fluid's potential to be recycled and cut costs. The fluid could be recycled by reducing or stopping the fluids that are pumped underground, or by injecting an acid. Modeling shows either would cause the hydrogel to disassemble into its original components: the water-polyallylamine solution and carbon dioxide. A pump would move the separated fluids to the surface, where they would be retrieved and used again. The fluid's recyclability hasn't been tested in the lab yet, however. The operational cost of enhanced geothermal systems could also be reduced with the new fluid. With less liquid to pump underground, there will be less water to purchase, capture and treat, which lowers project costs. However, a detailed analysis is needed to precisely quantify by how much the fluid could lower enhanced geothermal's price tag. Additional studies are needed to further evaluate the fluid's performance for enhanced geothermal systems. Fernandez and his team are planning lab studies to examine the fluid's recyclability and its ability to fracture larger pieces of rock. Their ultimate goal is to conduct a controlled field test. The Geothermal Technologies Office within the Department of Energy's Office of Energy Efficiency and Renewable Energy funded this research. This study used X-ray computed tomography and magic angle spinning nuclear magnetic resonance instruments at EMSL, the Environmental Molecular Sciences Laboratory DOE user facility at PNNL. The team also recently started a PNNL-funded study to examine a similar fluid for unconventional oil and gas recovery. The oil and gas extraction fluid being considered would use a different polyamine that is related to the chemical used in the geothermal extraction fluid. Both fluids are stable and can withstand extreme temperatures, pressures and acidity levels. Many of the fluids used for oil and gas recovery degrade, making them less effective over time. That characteristic, combined with the fluid's decreased water use, its nontoxic nature and its potential to be recycled, makes the PNNL fluid a candidate for oil and gas extraction. PAPER: HB Jung, KC Carroll, S Kabilan, DJ Heldebrant, D Hoyt, L Zhong, T Varga, S Stephens, L Adams, A Bonneville, A Kuprat & CA Fernandez, "Stimuli-responsive/rheoreversible hydraulic fracturing fluids as a greener alternative to support geothermal and fossil energy production," Green Chemistry Advance Online, March 25, 2015, DOI: 10.1039/C4GC01917B. EDITORIAL: W Leitner, "The subject of 'fracking' in Green Chemistry," Green Chemistry, online March 31, 2015.